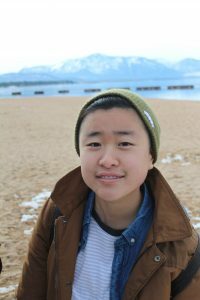 Image description: A queer Asian smiles and looks into the camera, wearing a beanie and brown jacket with layers inside. Background is Lake Tahoe and mountains out of focus. ANNA a APIENC intern alumni of 2016, is now an active volunteer with the Dragon Fruit Project Committee and part of APIENC Core! She identifies as a Queer Asian American person of color. Through APIENC’s summer internship, Anna was able to practice leadership and deepen her commitment to radically loving her community. During that summer, the CAA office was under renovation, so her summer intern cohort worked out of a temporary space in the Chinatown YMCA. Anna has a lot of fond memories of the different misadventures that occurred during that scrappy but fun time such as meetings in the “stairwell office” and park. This year, Anna is on the internship committee and is very excited to help pick the next Summer Organizer cohort. Outside of APIENC, Anna is the Operations Coordinator for Chinese Progressive Association (CPA). During high school, Anna was part of CPA’s Youth Movement of Justice Organizing (Youth MOJO) and helped found the Gender, Sexuality, and Diversities Program (GSD). She still volunteers with GSD today and is proud to help give queer, trans, and questioning youth a space to learn about their history and bond together. Her family is mostly low income and working class Chinese immigrants, so CPA’s work with their grassroots membership base is very personal to her. It was also during Youth MOJO that Anna first heard about APIENC.